Each year on April 10, students, teachers and school staff across the country and around the world wear pink to celebrate diversity, raise awareness, and put a stop to homophobia, transphobia, transmisogyny, and all forms of bullying. The International Day of Pink first began in Nova Scotia when two straight high school students intervened when they saw a gay student wearing a pink shirt who was being bullied. Wanting to do more to prevent homophobic and transphobic bullying, they decided to purchase pink shirts, and a few days later got everyone at school to arrive wearing pink, in a showing of solidarity. 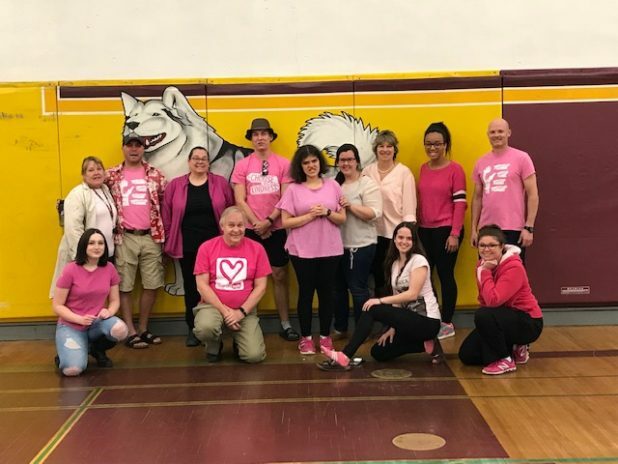 As one of the schools participating in the 10th International Day of Pink, the hallways and classrooms at North Hastings High School in Bancroft were a lot more colourful last Wednesday. NHHS principal Wayne Stewart sees the annual event as an important way to raise awareness of discrimination and shine a light on the social and personal impact bullying has on youth. He said it is also a powerful and effective way for everyone at the school to come together and stand up for those who have experienced or are experiencing abuse by a bully. “It’s a show of solidarity and it shows that we are accepting of all people at our school,” said Stewart. Although bullying does take place on occasion at the high school, Stewart said thankfully it happens rarely. When a case is reported however, he said there are several measures that can be taken to hopefully prevent it from happening again. Ideally, Stewart said the school will offer support to the student being bullied, while working with the bully to teach them how their behaviour is cruel and unacceptable. With more severe cases, he said expulsion is also an option. “We do provide consequences sometimes, but we have had success with restorative practices,” said Stewart. For more information on the International Day of Pink visit them online at: www.dayofpink.org; or email at: Info@DayofPink.org.